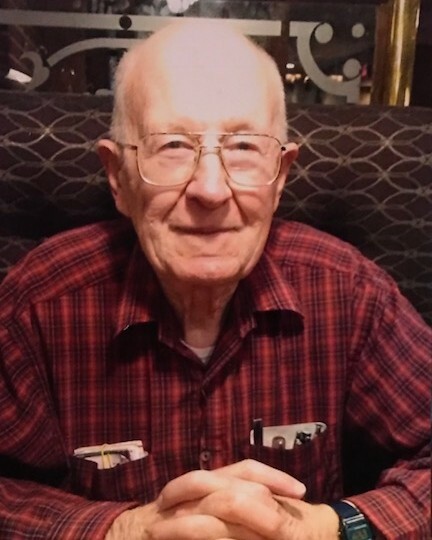 Edward Bethel, born on April 16th, 1930 in Sublette, KS to Robert and Lena Bethel; passed away on September 6th, 2018 at the age of 88. At the age of 13, his family moved to Garden City KS where he graduated from high school in 1948. That year he joined the Navy. He completed a Navy Aviation Electronic course and was later accepted as a Naval Cadet to begin pilot training. He received his commission and wings in 1951 and at the time he married his high school sweetheart Joyce Marie Carey. He flew combat missions during the Korean War and was released from active duty in 1954. He flew with United Airlines for a short time and then enrolled at Kansas State University in 1956. He graduated with an electrical engineering degree in 1959. In 1960 he took employment with Eberline Instrument Corp. in Santa Fe, NM where he remained until retirement in 1995. He was a member of the First Christian Church in Santa Fe. A lifelong church member, he served as treasurer at various churches for many years. He was a dedicated blood donor with over 18 gallons given. He leaves behind a daughter, Christine Eitel of Kirksville, MO., a son David and daughter-in-law Deborah, grandsons Gabriel and Jared, granddaughter Amber and her husband Daniel and great grandchildren Daniel and Haley. Services will be at 12:30 on Wednesday, September 12th at Berardinelli Funeral Home. Visitations at 12:00. Burial to follow at 2:15 at Santa Fe National Cemetery.